Introducing our Business of the Week Tino’s – based on Wind Street, this is one of Wind Street’s hidden gem! Not only is it open daily for Lunch and Breakfast, Tino’s also has a delivery service throughout SA1 and SA2. In addition to great food, Tino’s is licensed (until 12am) and holds regular themed nights at the venue including live music, Poetry nights, Comedy and Salsa too! And if that’s not enough, you can also hire the venue out for private parties! 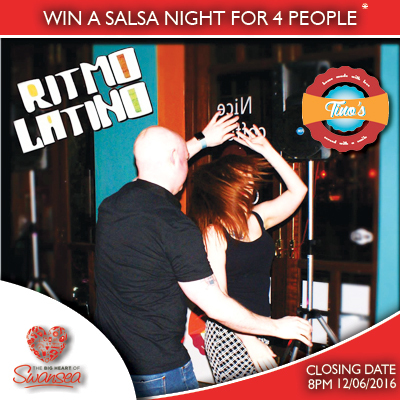 For your change to WIN a Salsa night for 4 people at Tino’s simply COMMENT on our Facebook update with the name of 3 friends you’d take along to the Salsa night! Don’t forget to like our page too as we’ll be announcing the winner on Monday 13th June – SHARING the photo isn’t essential to enter the competition but it would be great to spread the word!